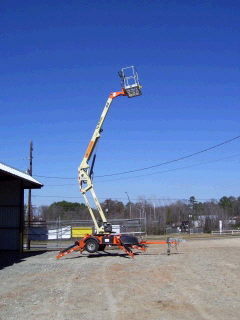 35' BOOM LIFT, WORKING OUTREACH 20', UP AND OVER HEIGHT 15', 500 LB CAPACITY, PLATFORM SIZE 30"X48", RECHARGABLE BATTERY, 2" BALL, TOWING SPEED-55 MPH, BRAKES: HYDRAULIC SURGE. AIR AND WATER LINES TO THE PLATFORM, MOUNTING TRAY ACCOMONDATES CUSTOMER PROVIDED GENERATOR, AIR COMPRESSOR OR PRESSURE WASHER. * Please call us for any questions on our lift towable boom 35 foot rentals in White Oak, Longview, Gilmer, Gladewater, Big Sandy, Kilgore, and all of East Texas.